Visit Multiple Disc Sets Page on our Main Site! 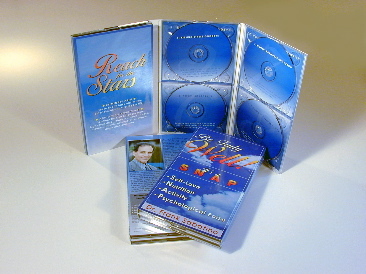 Multi disc dvd sets can be packaged in a variety of ways. We can create packages to hold 2 to 10 discs in one package using trays (plastic, paper or foam) , pockets or hubs, and wrapped together in a slipcase. Or we can take a multi volume approach and package 2-4 discs in smaller sets, and then package them all together in a slipcase box set. Portfolio Folders tend to use foam hubs to hold multiple discs, as well as a pocket for literature and a slot for business cards. Multi Disc Jackets can hold about 3 discs per tall panel, depending on overall height. We have many dies from existing projects, but we're happy to customize for you to create exactly what you need for your project. Literature and other items can also be enclosed such as large perfect bound books, postcards, stationary, business cards, and even small retails items such as USB devices, stickers and stencils. Also available are alternate packaging options such as wallets, binder pages, accordian paks, retail hangtags, and custom made retail boxes. Includes the manufacturing of printed, pressed discs.